First of all, I must say that I am so grateful to all the wonderful sponsors who have helped me pull my makeover together the last month. 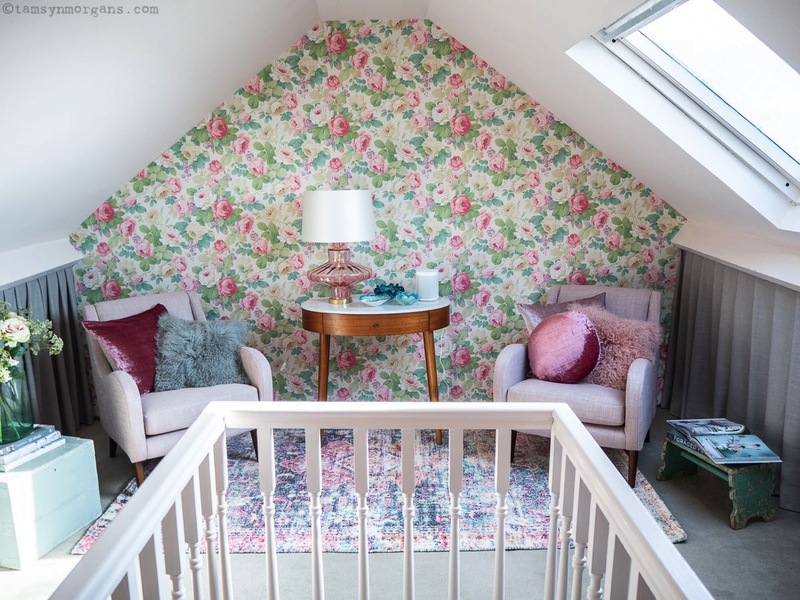 It’s been a challenge, but one that I’ve really enjoyed, and I can’t believe that the children and I now have this whole new extra room in the house! Only one month ago it was a place to fling stuff in a hurry, it’s now a little retreat at the top of the house. My daughter said to me last week, ‘We can sit up here and chat!’. Yes we can. We can sit here and chat, drink tea, work (I thought our wifi would be atrocious all the way up there, but it actually works pretty well! ), whatever takes our fancy. 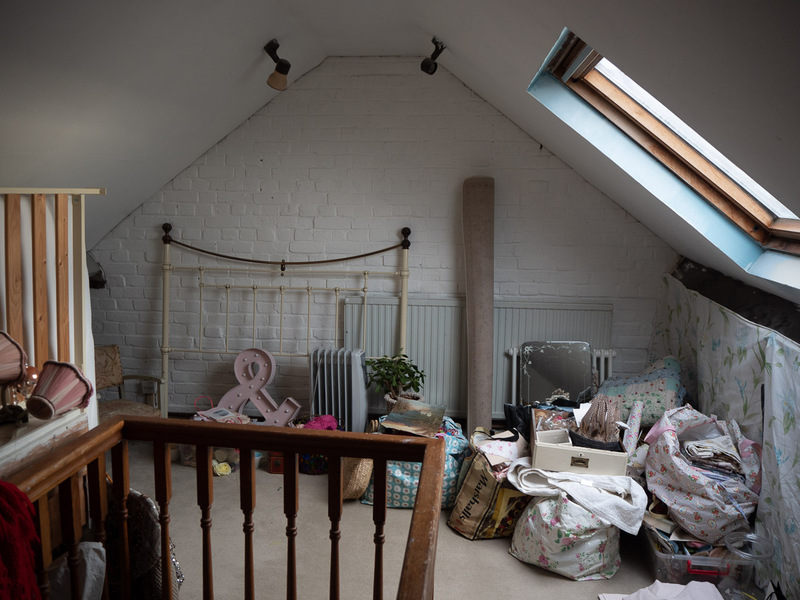 So without further ado, let me again share some ‘before ‘ snaps with you form just a month ago – I have even managed to dig out snaps of how it was when I moved here. Used as a dumping ground for the past 5 years, I always knew this room had potential, but I lacked the motivation to give it the makeover it deserved. So when Lisa and Bianca approached me to take part, I knew that it would be the incentive I needed to make it beautiful. All to be completed in one month too! No time for procrastination! 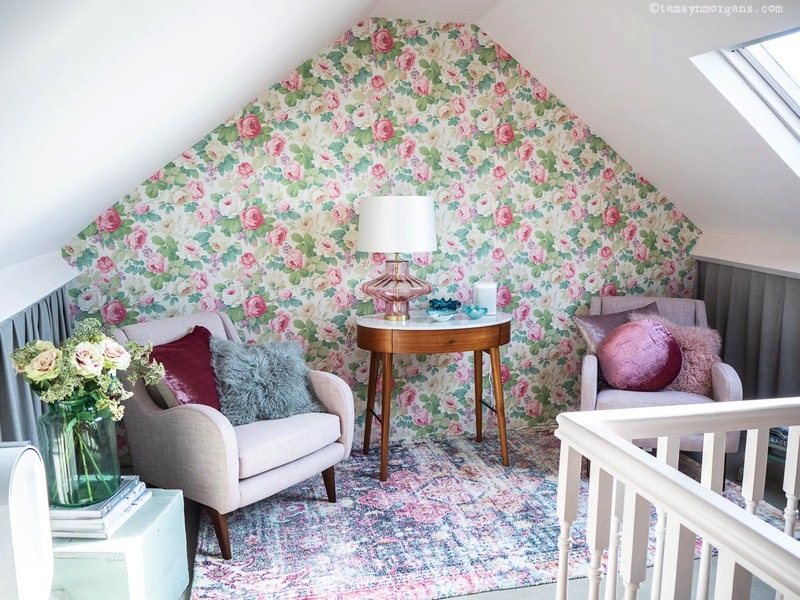 I have always loved the Chelsea wallpaper by Sanderson from Style Library, so I decided to go full floral by making a feature wall down one end of the room. 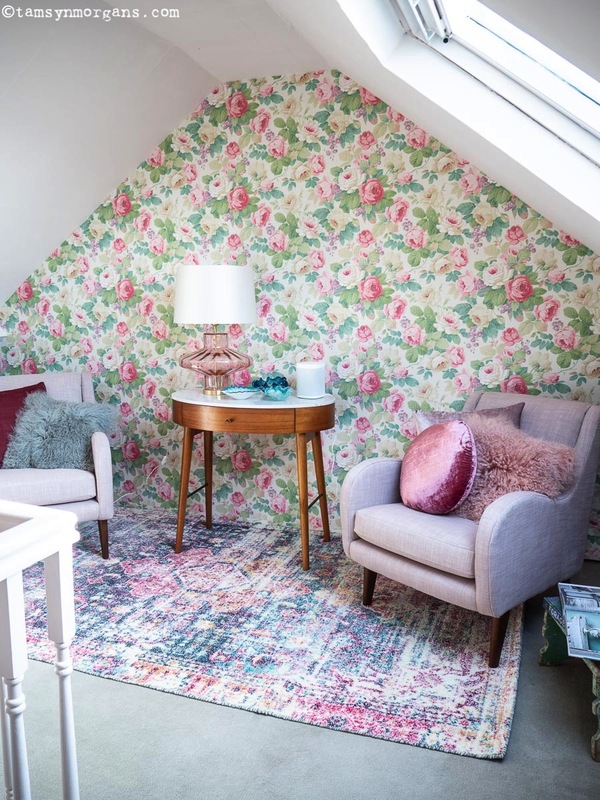 I had the brick wall covered with plasterboard, and did the wallpapering myself (I actually REALLY enjoy wallpapering!). Chelsea comes in lots of lovely colour ways too, so there’s something for everyone. 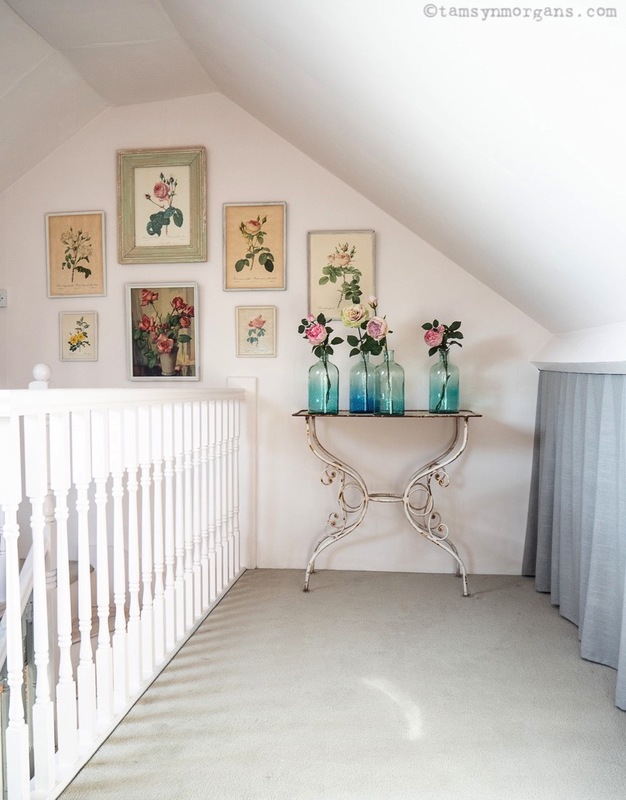 When it came to paint, I decided to go for a soft shell pink, and Sea Pink by Sanderson at Style Library fitted the bill perfectly. 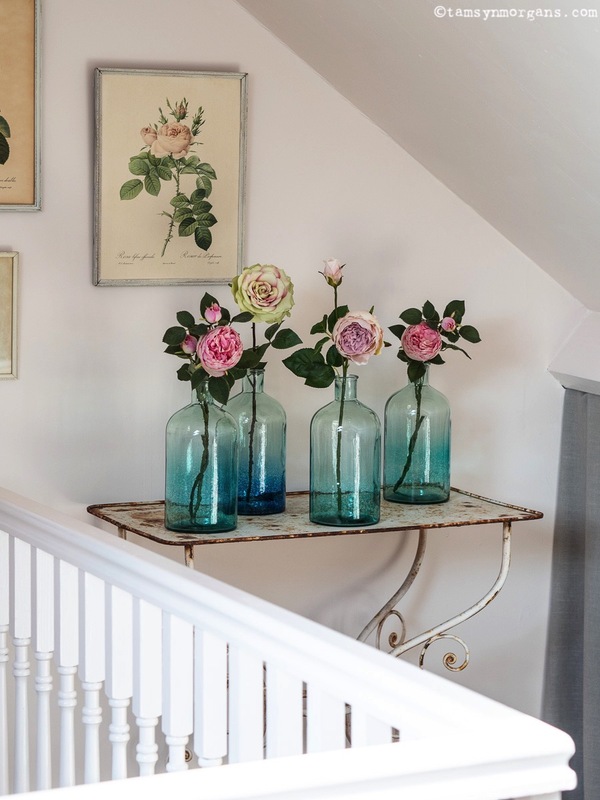 It’s the perfect vintage pink, not too sugary sweet, and to keep the whole room flowing, I painted both the walls and woodwork in this colour. To create storage and hide away all my clutter, I made these simple curtains from Deben in Dove Grey by Sanderson at Style Library. I simply hemmed the bottom and tacked using a staple gun to the back of the wooden beams. 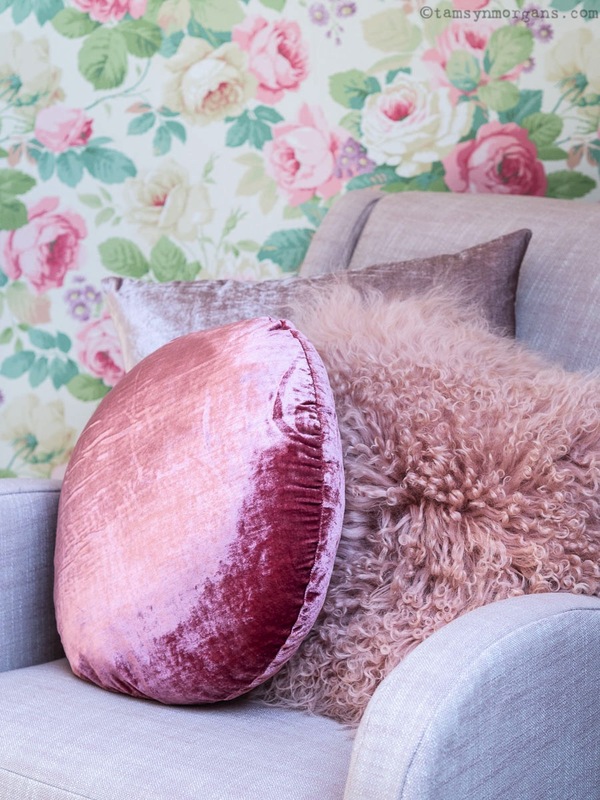 I knew I wanted comfortable seating, that not only looked beautiful, but that would be perfect for curling up on with a good book and a glass of wine. 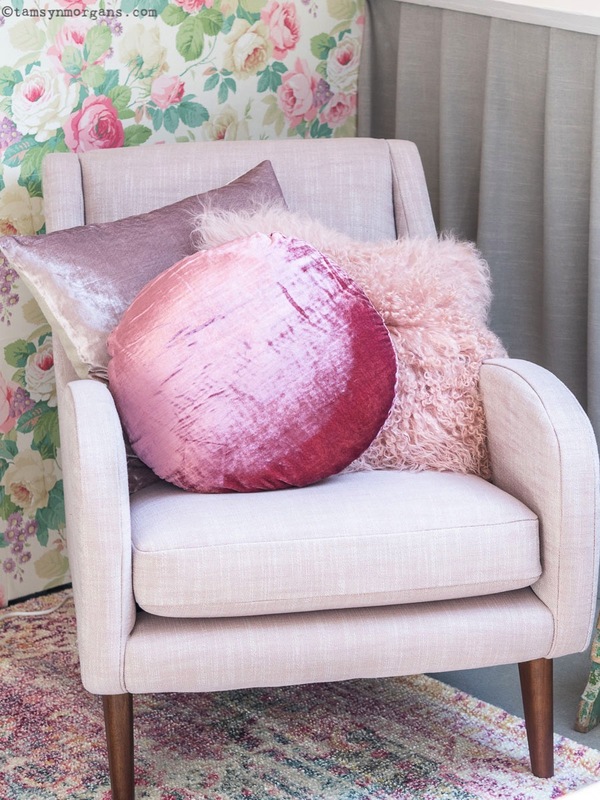 These Sebastian Chairs from Westelm fitted the bill, I love their slightly retro feel, and these luscious velvet cushions and Mongolian lamb cushions are the perfect addition with their blush pink and grey hues. I love this cute Penelope Mini Desk with it’s gorgeous marble top, it’s got a slightly retro feel to it which is perfect for this space. 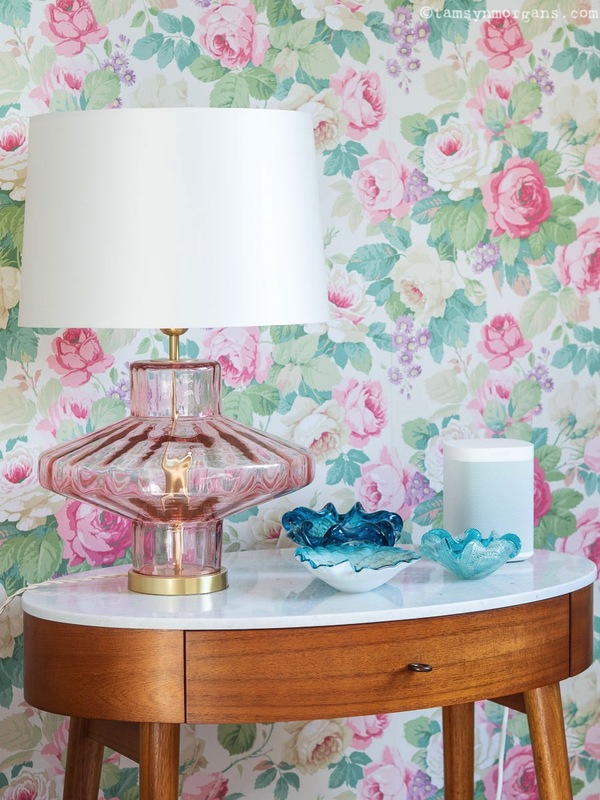 This stunning Vienna Table Lamp from David Hunt Lighting is a real statement piece with it’s rose pink glass base, and it looks so beautiful against the wallpaper. I added a few of my 1960’s vintage turquoise glass bowls, along with my new favourite bit of technology, the Sonos smart speaker. 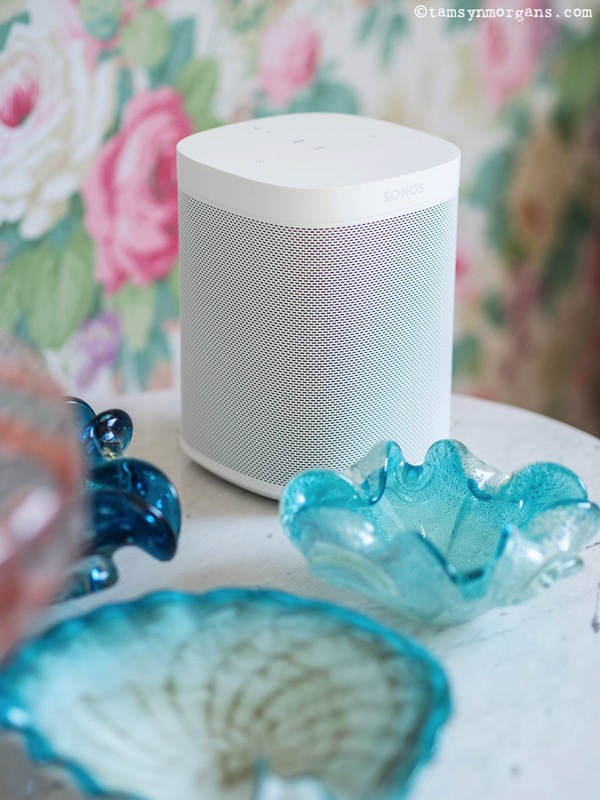 As a big music lover, this has been a been of a revelation to me – the sound is incredible, and I think I’m going to have to invest in another as you can link them up and create your own home sound system! 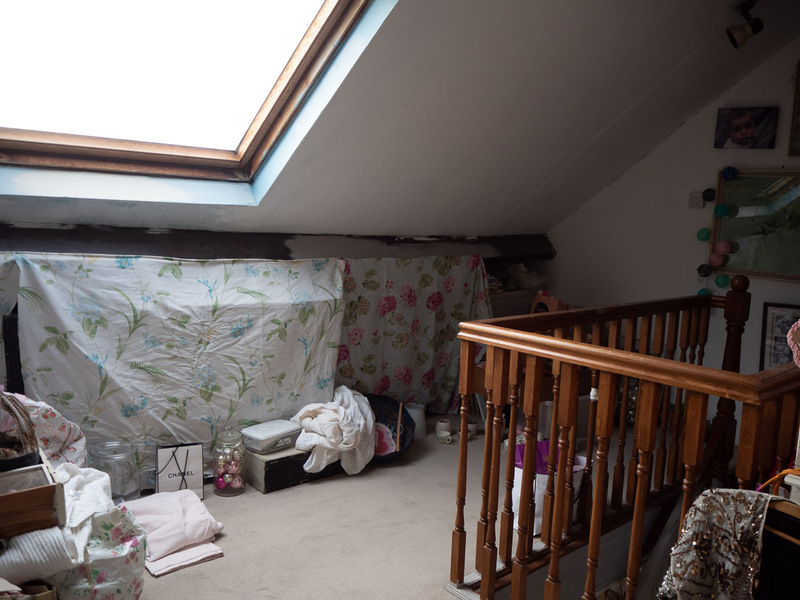 Since I had the defunct radiator removed to make way for the plasterboard wall, I was concerned about how I was going to keep the room warm in the winter months. 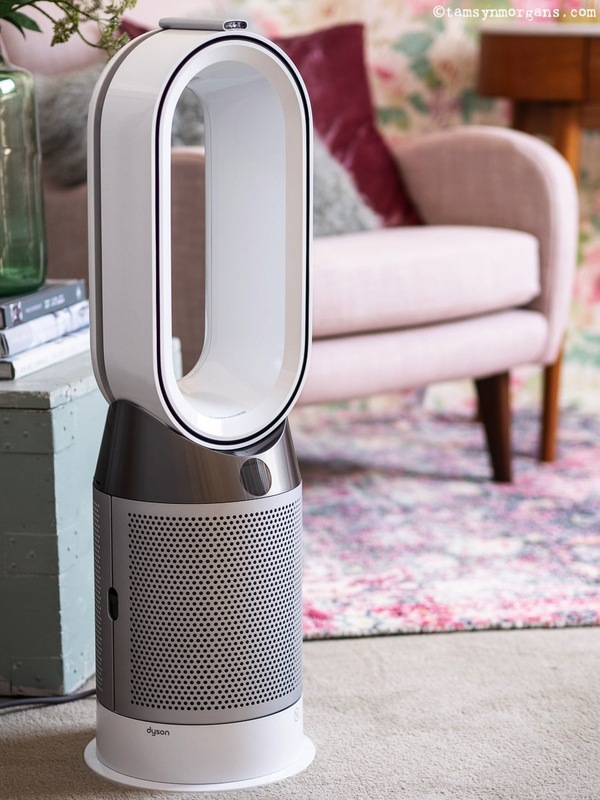 This amazing Dyson Hot and Cold Air Purifier from AO.com has been brilliant the last month – not only for keeping me warm whilst working on the makeover, but also for helping with keeping the air clean whilst painting and decorating. Plus with it’s contemporary design, it fits really nicely into my new space. For some finishing touches, I paid a visit to Dobbies Garden Centre. Initially I assumed I’d pick up some house plants, but then I came across these gorgeous artificial roses. 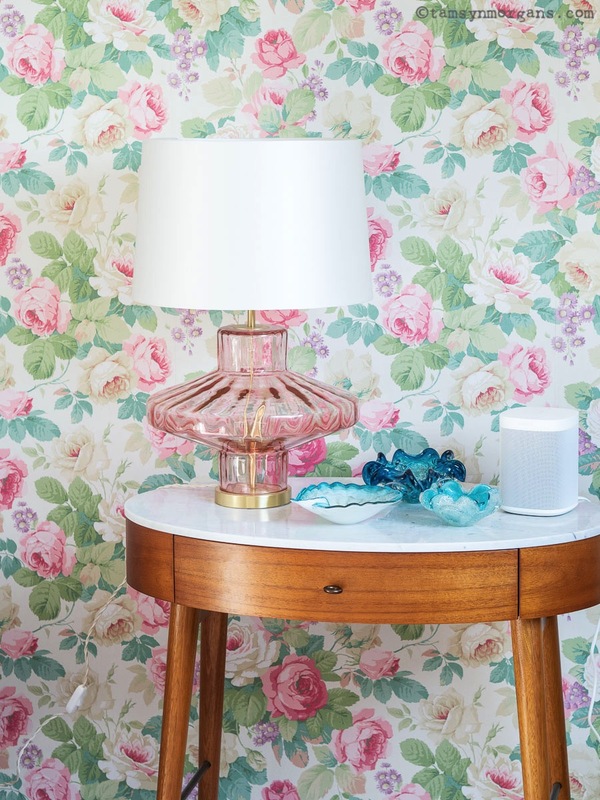 I was already planning on creating a gallery wall of vintage rose prints to tie in with the Sanderson wallpaper, so I decided to use these blooms to really bring the florals to life. 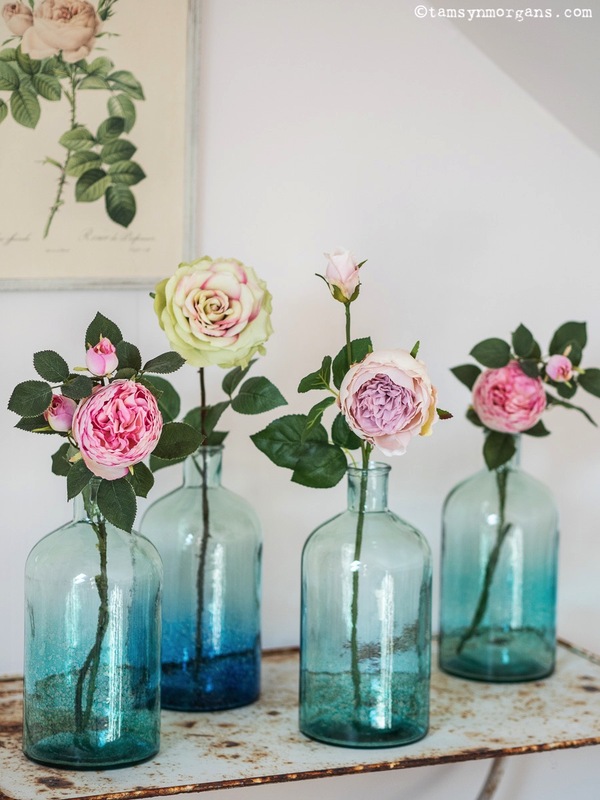 I love them displayed en masse in these gorgeous recycled glass bottles, also from Dobbies. 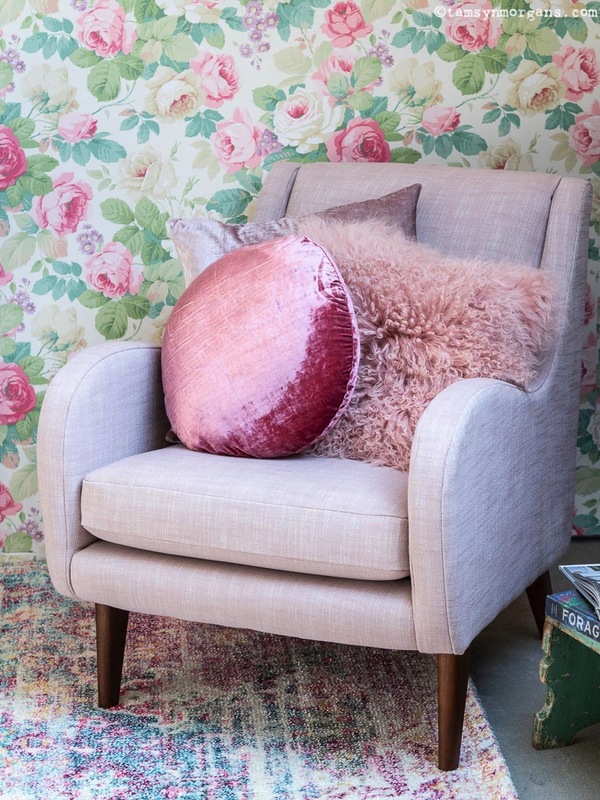 I absolutely love the colours in this stunning Rhea rug from Westelm , and I knew I was taking a bit of a gamble by placing it next to the Chelsea wallpaper. 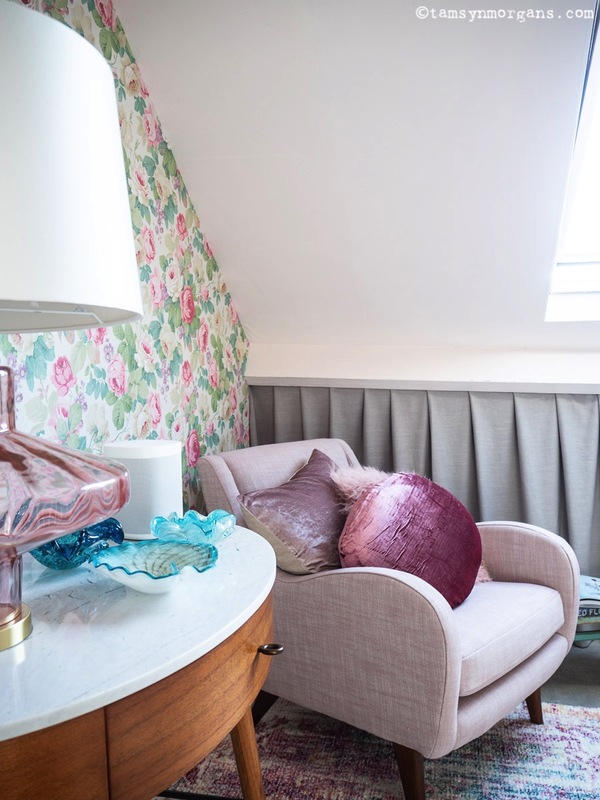 However regular readers of this blog will know that I’m not afraid to mix colours and patterns, and this room can take it – I love all these summery vibrant hues together! This weekend just gone, the children and I sat up in our new room, all quietly doing our own thing. They already love this extra space, and I keep hearing them scuttle up there with their books/notepads/Lego! We have even had the window wide open to let the spring sunshine pour in. 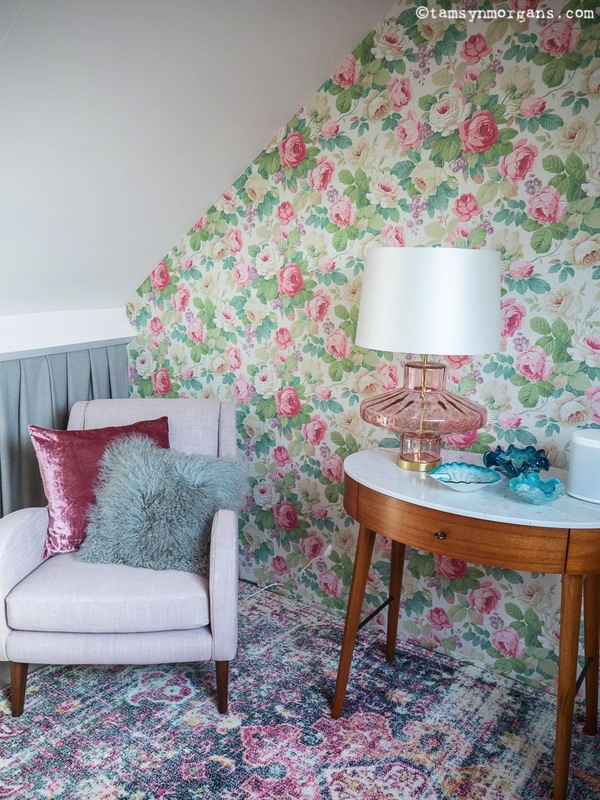 Thank you so much for following along on my Revamp Restyle Reveal challenge, I hope you’ve enjoyed seeing my attic transformation! 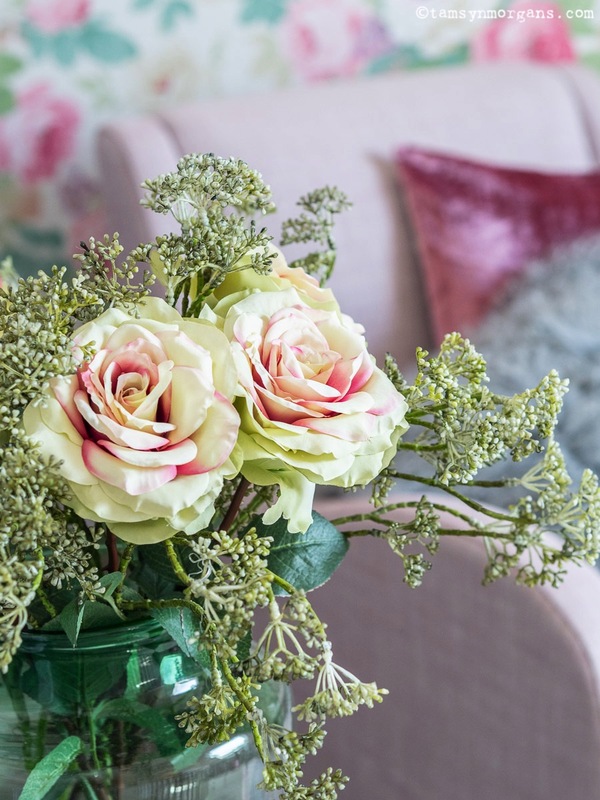 It’s now time to send you all over to Malcolm at Design Sixty Nine who is next on the blog hop list with his beautiful living room makeover. 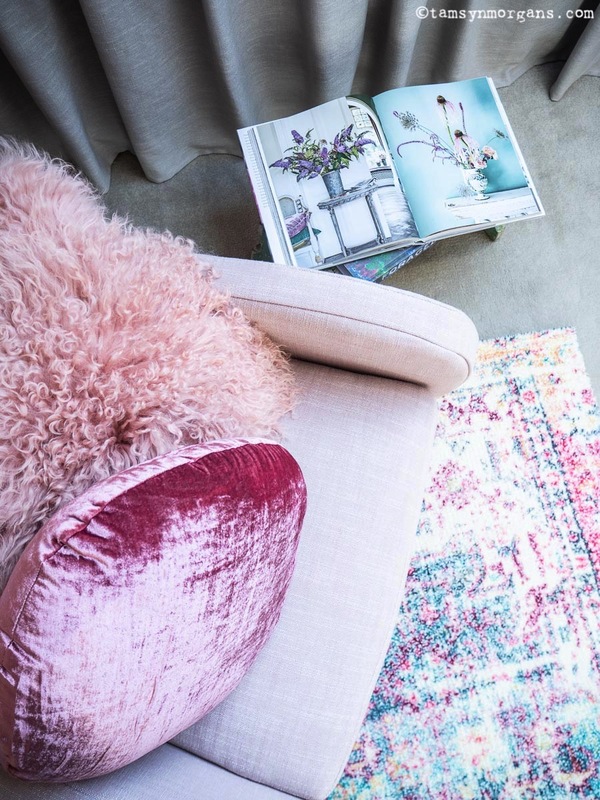 Please do go and checkout all the other bloggers rooms too by following the blog hop links in all the posts, there’s also a full list with links down below! 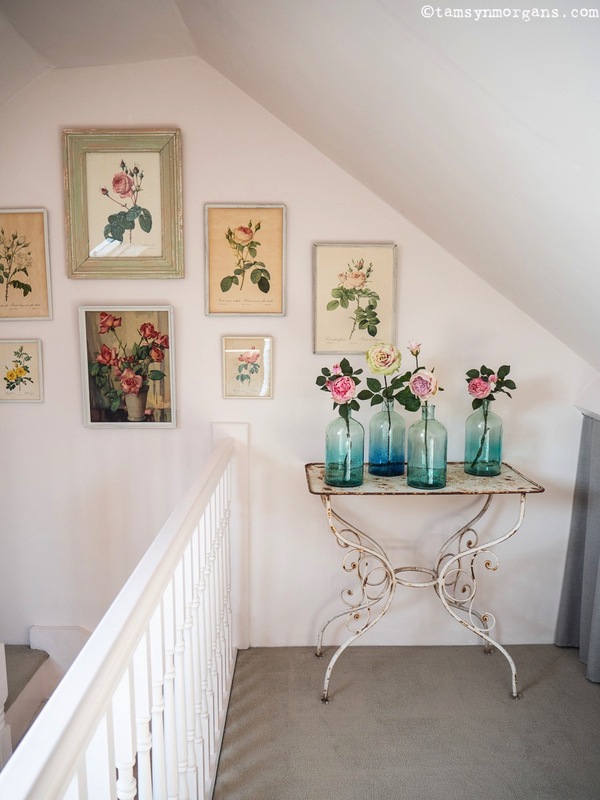 Now off to plan my next project – I have some vintage floral wallpaper that I think will be perfect on my landing, watch this space! The full Revamp Restyle Reveal Team! Previous Post Car Boot Fair Treasure! This is a dream!! So proud of yourself I hope? It’s stunning Tamsyn, well done! So so pretty. You did a beautiful job pulling it all together. Mixing in your own bits and pieces was inspired! I’m off to check the other blog posts. Oh, it’s charming. I love it! 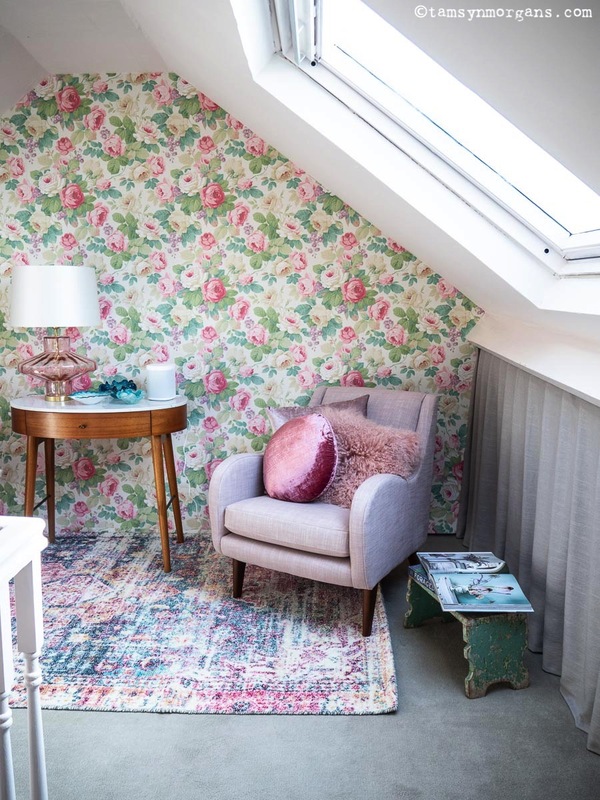 What a perfect little space. I know that’s where I’d hang out too! Great job. It looks so pretty Tamsyn – I love it! You’re giving me some much needed inspiration for my basement room! So beautiful, Tamsyn. What a delightful space you now have!